Josep Maria Bartomeu has kept his position as Barcelona president, beating Joan Laporta, who held the post from 2003 to 2010, in the election. 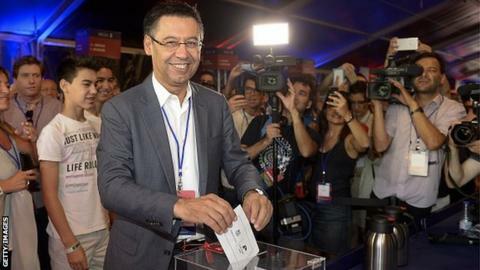 Bartomeu, 52, received 54.63% of the votes cast by club members and will now lead the club for the next six years. He endured a turbulent spell having taken over in January 2014 from Sandro Rosell, who stood down following the Neymar transfer scandal. Laporta had planned to sign Juventus midfielder Paul Pogba, 22, if elected. But Bartomeu's bid was boosted by Barcelona's victory in this season's Champions League, along with triumphs in La Liga and the Copa del Rey. Laporta, president of the Catalan club from 2003 to 2010, had also planned to end their shirt sponsorship by Qatar Airways, promoting a charity instead of the front of their kit. Some 47,720 Barcelona members, including head coach Luis Enrique, midfielder Andres Iniesta and former captain Xavi voted.